The iPad offers musicians an alternative to carrying physical sheet music and lyric sheets onstage with them. A growing number of score-reading apps are available in the iTunes Store. When you load all your charts and scores into such an app, you can conveniently organize and display them on your iPad, making custom setlists for your various gigs. Sync your iPad to your computer using a physical cable connection. Choose iPad from the iTunes window. Scroll down to the iTunes File Sharing window. Select the app’s name (in this case, GigBook). Press the Add button in the Documents. Navigate to the file you want on your computer. Select the file you want and press Choose. Another way to import scores in many sheet music readers is by opening the file in another app and then using the Open In option, which can be used for email attachments, and from apps like Dropbox, GoodReader, Evernote, and more. Open the PDF in whatever PDF reader you have. Look for the “sharing” icon and tap it. This opens a window giving you choices for how or where you want to send it. One of the choices should be Open In. You’ll see a menu of the apps you have that can open the file. One should be your sheet music app. Tap the sheet music app’s icon to open the PDF in it. If your PDF is in the form of an email attachment, tap the icon for the attachment and you should see icons including your sheet music app. Tap your app’s icon to open the file in it. Fully featured sheet-music readers such as GigBook or forScore LLC’s forScore app offer a variety of features, including the ability to annotate your score by drawing with your finger, organize scores into setlists, check tempos with a metronome, and lots more. With your iPad onstage in a holder on your mic stand, your sheet music reader app opened, and your music arranged in a setlist corresponding to the one you’re using for the show, you’re ready to go. Turning the page in a score is typically achieved by swiping one direction or the other on your iPad’s screen. One app, called Tonara, offers a “polyphonic music following” feature, which uses the iPad’s mic to listen to the audio of your performance, and automatically turns the page when you get to the corresponding spot in the score. In most situations and with most sheet music reader apps, you have to manually turn the pages in your score. That can be problematic if you’re playing an instrument and your hands aren’t free to swipe your iPad screen. 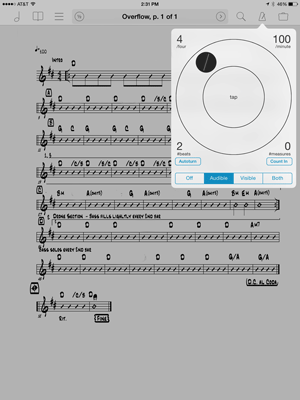 Luckily, several companies, such as AirTurn, PageFlip, and BiLi, make page-­turning systems that use Bluetooth to wirelessly send page-turn commands to a sheet-music–reader app running in your iPad. IK Multimedia’s iRig BlueBoard can also be used for wireless page turning. These devices come in the form of a foot-pedal unit with two or more pedals attached to it. When you pair the unit with your iPad, which is typically pretty simple, the Bluetooth page turner turns pages in any compatible app. Usually, one pedal is for page up, and another for page down. For a two-pedal unit, figure on spending somewhere in the range of $90 to about $150, depending on the brand and model. Not all apps support all pedals, so double-check before buying. You can also find a number of apps that let you create, display, and save setlists, and many also let you display song lyrics. Many setlist apps are available, and many of these also include lyric readers. For setlists, you enter song names and certain song info, and then you can rearrange the songs in whatever order matches your set. Strangely, some of these apps don’t let you enter the key, which is, pardon the expression, a key item of information for a song in a setlist. Luckily, there’s an easy work-around, which is to add the key right after the song name when you’re entering it. When you have all your songs entered, you can create a setlist, and save it with information about the gig. Metronotes (Grincheux, free): You can’t beat the price, and this app lets you enter song names and song info under separate band names, making it really easy to juggle multiple bands’ song and setlist info. Setlist Maker (Arlo Leach, $4.99): A fully featured setlist maker for iPhone and iPad that also features lyric sheets and lyric sheets with chords, customizable performance layouts, and a lot more. Setlists (Bombing Brain Interactive $9.99): Create setlists and lyric sheets with this app, which gives you a great deal of control over the look of the lyric sheet, including background color, text color, and font size. It also lets you break up the lyrics into smaller sections, each on its on page, so that you can use a really large font. 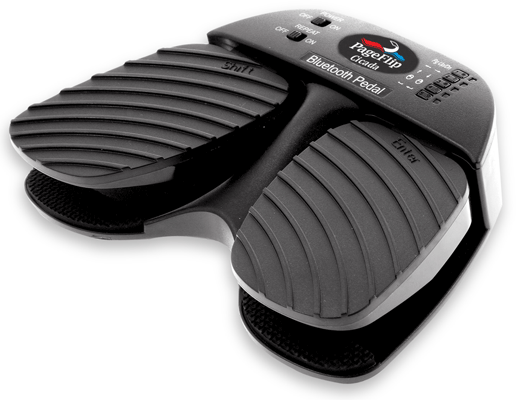 You can even use an AirTurn BT-105 for hands-free page turns. SongSheet (Ghostdust, $6.99): Not only does this app do setlists, but also lyric sheets with chords, if you want them. It features a WYSIWYG editor for creating chord charts (chords above lyrics, no bar lines or rhythmic notation), and lets you add unlimited songs and setlists.